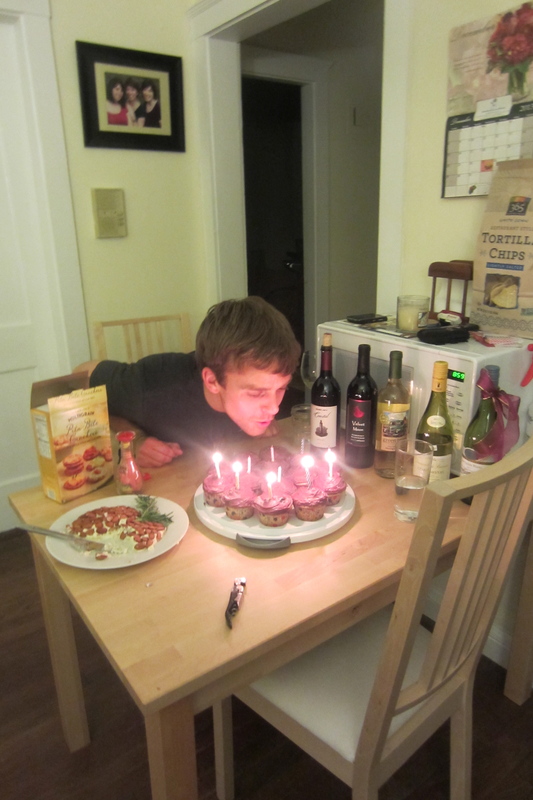 Post 91 – Cupcakes for dinner! Of course I’m not talking about regular cupcakes – these are meatloaf cupcakes, personal meatloaves, muffin-shaped meatballs, meat-cakes or whatever you want to call them. They are quicker to bake than one big meatloaf and can be personalized and even decorated if you’re feeling fancy. I’m sure they would be a hit with young kids. 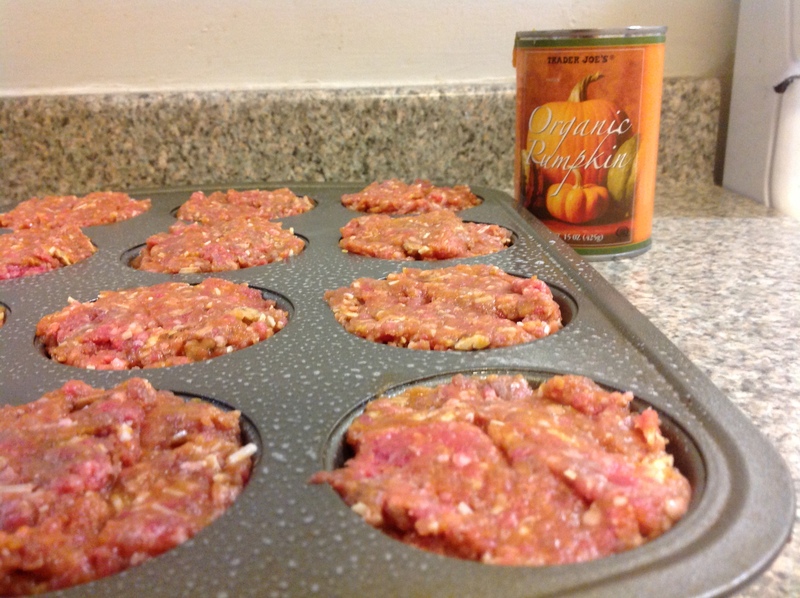 Start with your favorite meatloaf or meatball recipe, grease (or line with baking cups) a muffin tin and smoosh that meat mixture right in those muffin cups. I adapted this scrumptious recipe for meatballs with pumpkin in them and I highly recommend it (just use canned pumpkin instead of the butternut squash to save time). Bake them at 400 degrees for about 20 minutes or until cooked through and nicely browned. NOTE: You might want to put the muffin tin on a sheet pan just in case the grease spills out and burns on the bottom of your oven. 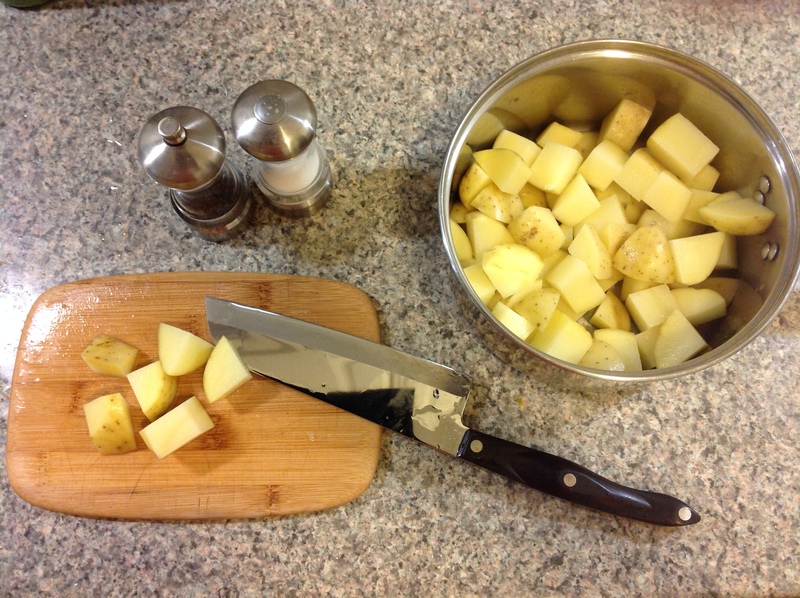 While they’re baking, chop up some potatoes (any kind), boil, and mash with a bit of butter and milk. 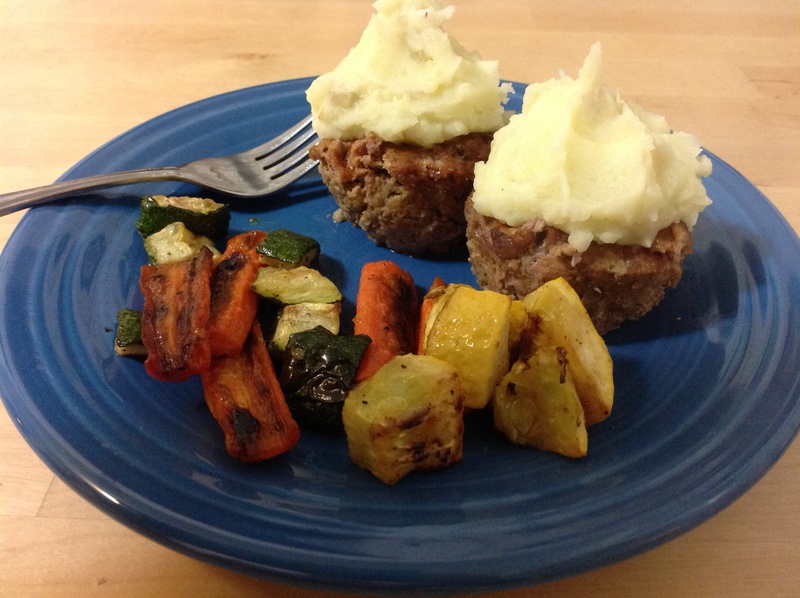 Top your tasty meat muffins with your choice of mashed potato or sweet potato “frosting” – piped on if you’re feeling extra special (though if you leave the skins on the potatoes, as I did, piping is a little tricky so I just dollop-ed). Serve them up with your favorite roasted vegetables, salad, or sauteed greens. Delicious, easy, and sure to make you feel like you’re having a treat. Preheat oven to 400 degrees F. Prepare a muffin pan with cupcake liners or spray with a pan spray. I made about 16 muffins with my mixture. If you have time and so desire, toast your pecans for a few minutes in a saute pan on the stove or on a sheet pan in the oven. Be sure to watch them so they don’t burn. This should only take a minute and really enhances the flavor of the nuts. In a large bowl, lightly beat your eggs to break up the yolks. Add in the remaining ingredients (including pecans, making sure they’ve cooled a bit) and mix to combine all ingredients. Divide the mixture between the muffin pans, filling the meat muffins to the rim. You could try mounding the mixture slightly too if you like that look, though they might make more of a mess. Bake in your preheated oven for 20 minutes or until a thermometer registers 165 and they are nicely browned. Top with homemade mashed potatoes and serve. Yum! Have you ever heard the Shel Silverstein poem that starts: “I’m writing these poems from inside a lion and it’s rather dark in here…” ? Well I’m writing this post from inside a congested head cold and it’s rather stuffy in here, which made me think of Silverstein’s poem. It was a good weekend, a busy weekend, which is why I think I’m sick now. It started out Friday evening with a wonderfully acted play called The Yellow Boat, performed by the middle school at the school where I work. The kids did an amazing job and I was moved by their performance. Check out the script if you’ve never heard of it. Warning, it’s a tear-jerker! 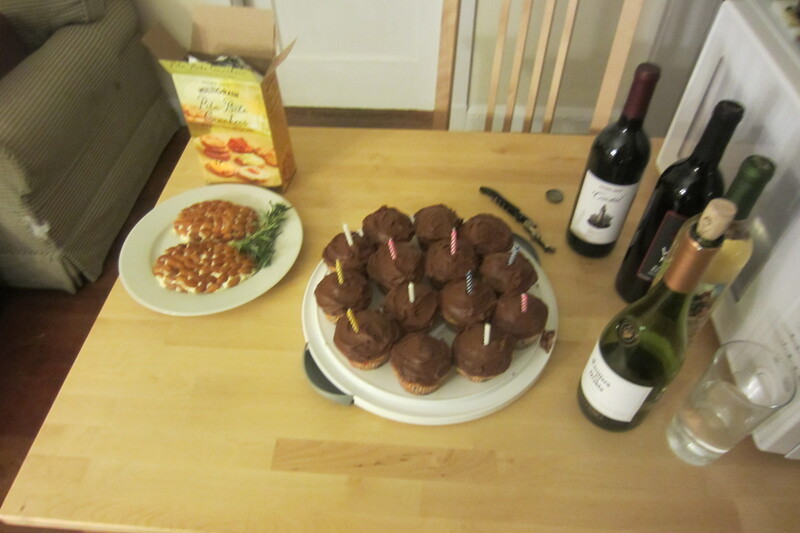 Saturday Sam and I prepared for our housewarming/birthday party – there were cupcakes and appetizers to be made, wine to be bought, and house cleaning to do, of course. People loved the chocolate frosting on the cupcakes (same as last year requested by Sam) and the appetizers went over pretty well too, despite a slightly runny cheese ball. I spent much of the day Saturday either lugging groceries from store to home or racking up mileage in my kitchen going from fridge to counter to fridge and back. Sunday was equally busy as I spent it cooking (and cleaning) pretty much from dawn to dusk. Needless to say the work paid off. I remembered to bring everything (except the darn camera!) and the party was a hit! At the end of the party, the host toasted me and my companion (his housekeeper – without her I couldn’t have pulled off such a big party since she helped me clean everything and tray the apps). He even invited us to join the party and have a glass of wine. We politely declined in favor of dragging our tired bodies home instead. Despite not using the labels I had brought to tell the guests what items were, (everyone thought the prosciutto pinwheels were cinnamon rolls – oh well) everyone thoroughly enjoyed the food. The runny, bacon cheese ball, which had been such a mess when I practiced it for our party guests turned out beautifully for Sunday’s party, and the spinach bites were a surprise sell-out! The day ended happily despite my lack of sleep Saturday night and I came home exhausted and happy to find the laundry done and dinner made by my ever-supportive and loving guy. What would I do without him? The only negative consequence of a successful weekend is my poor health, so I recommend to you if you’re throwing a holiday party to keep it small and don’t cook for two parties back to back. I learned my lesson. And if you’re hosting a party and you want an easy hand-held appetizer, the prosciutto pinwheels are sure to please and simple to make. Just make sure people know what they are! Happy cooking. Spread with as much or as little creamy, herbed cheese as you desire (Causing a Stir recommends 10-12 oz. 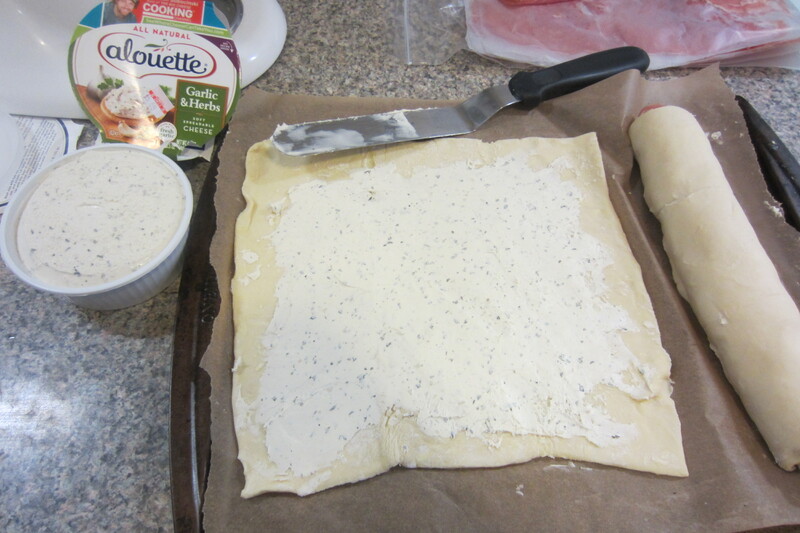 of the Alouette brand cheese for 2 puff pastry sheets) leaving a 1/2-inch border on one side to seal (the picture above is before I had finished spreading all of the cheese). 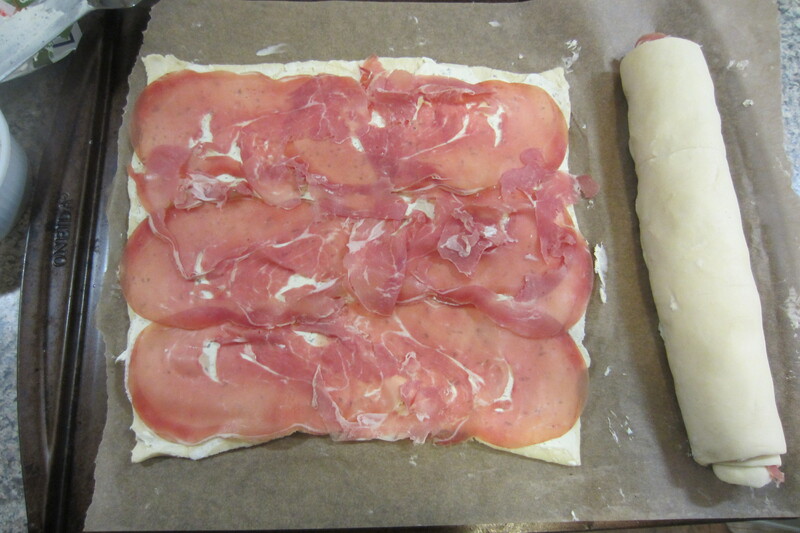 Layer with thinly sliced prosciutto (3.5 oz per roll) to cover the entire surface, still leaving the 1/2-inch border. Tightly roll (like a cinnamon roll) toward the edge that you left uncovered. Moisten the border with a bit of water and gently press it into the roll to seal the edge. 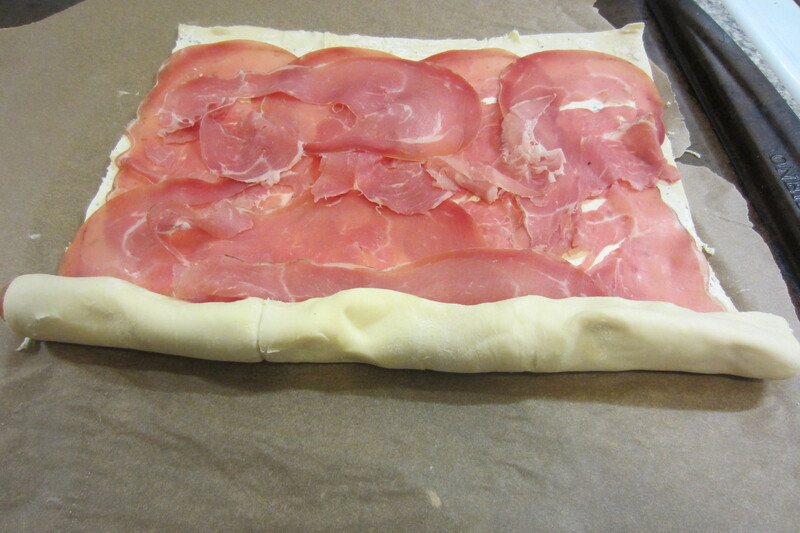 Repeat with remaining puff pastry, cheese, and prosciutto. 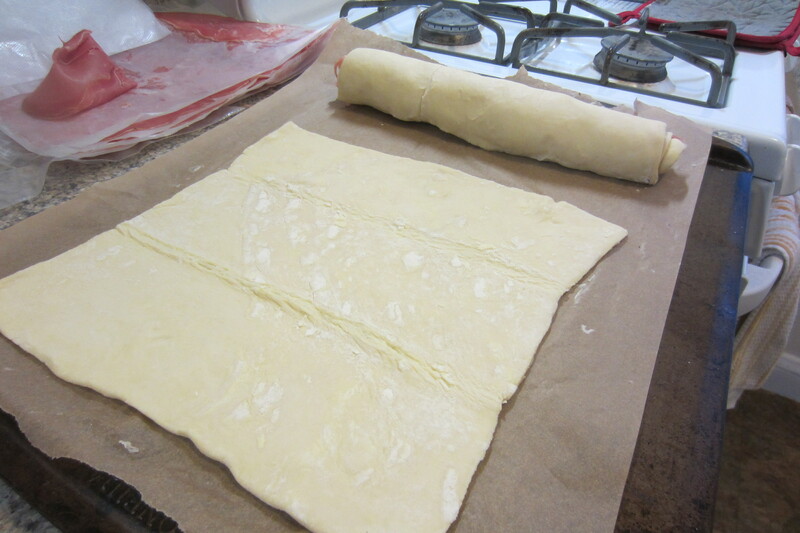 Freeze the rolls for 45 minutes or until firm. Slice into 1/4-inch slices and bake on parchment-paper lined sheet pans at 450 degrees for 10-15 minutes or until lightly browned. Let cool and serve! I wish I could show you a picture of the result, but since I forgot the camera for the party I have nothing to show. Make them for yourself and you will see. Delicious and beautiful. Here’s to more holiday (and other) parties!